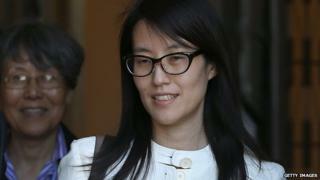 Ellen Pao, the chief executive of influential news and links sharing website Reddit, has resigned. Ms Pao had been the subject of intense criticism over her handling of the site, one of the web's most visited, since taking over late last year. A petition with over 200,000 signatures called for her removal. In a statement, the site criticised some of Reddit's community over "sickening comments" made towards Ms Pao. "The reduction in compassion that happens when we're all behind computer screens is not good for the world," wrote Sam Altman, a lead investor in the site. "People are still people even if there is internet between you. If the Reddit community cannot learn to balance authenticity and compassion, it may be a great website but it will never be a truly great community." Speaking of Ms Pao's contribution to the site, Mr Altman said: "We are thankful for Ellen's many contributions to Reddit and the technology industry generally. "She brought a face to Reddit that changed perceptions, and is a pioneer for women in the tech industry. She will remain as an advisor to the board through the end of 2015. I look forward to seeing the great things she does beyond that." Ms Pao told the New York Times: "It became clear that the board and I had a different view on the ability of Reddit to grow this year. "Because of that, it made sense to bring someone in that shared the same view." Steve Huffman, a co-founder of Reddit and former chief executive, will take over from Ms Pao who will remain as an advisor to the board for the remainder of 2015, Mr Altman said. Reddit, which is over a decade old, bills itself as the "frontpage of the internet". The hugely popular site allows users to share links on any conceivable subject. Other users are then able to up- or downvote links. The popular links rise to the top of each sections, with the most viral making their way to the hallowed frontpage. Links here are typically viewed millions of times in a short period. Earlier this month Reddit's users reacted with fury after Victoria Taylor, an employee with the firm, had been sacked. Ms Taylor oversaw the "Ask Me Anything" (AMA) section of the site that interviewed celebrities, politicians and other newsworthy figures. Hundreds of the site's chat sections, known as sub-reddits, were shut down in protest at the decision.